I might as well call it a love story. I’ve yet to meet anyone who does not smile and fall in love with the Miata. As always, when a new test car arrives I immediately take it to Aaron Jenkins-Editor of FORZA magazine which is all about Ferrari. He used to race a Miata so I supposed he is somewhat biased but nevertheless in love with what is the most fun for the least money in the World of automobiles. Yes, I know you can buy second or third hand Maseratis for 30 thousand dollars and yes, the valet at the Ritz Carlton would be most impressed but then he wouldn’t have to pay the maintenance. With the new Miata of course you do get a warranty and in many ways it is so simple that very few things can go wrong. The engine has been uprated to 181 hp from 155 and as long as you keep the revs over 3000 rpm it goes just fine. I had what I would call the targa version and folks loved it. Loved it at the tennis club and loved it at Costco. Yes, Costco. Editor Jenkins waved me good bye with a “good luck at Costco” but he was wrong. Being single I filled the passenger seat, the trunk-which already had all my tennis gear in it-easy peasy. The love affair the automotive press and the tens of thousand of owners have had with this little gem for something like 30 years is understandable. It has that cheeky look which everyone loves. It isn’t a guy’s car or a girl’s car this baby is for everybody. The weather has been awful in the Bay area but every time I saw just a little bit of blue sky I hit the button and hey presto the roof was off. Didn’t time it but it had to be under 10 seconds. One of my oldest friends in the automotive tuning world is Jan of Janspeed. A Hungarian refugee who arrived to Britain penniless like the rest of us he started bending pipes and tinkering with engines. Intake valves, exhaust valves, he even made my MGB go quicker. This is similar to what happened to the Miata’s engine which is now redlining at 7500 as opposed to rpm 6800. Would I personally like a little bit more? Yes but I dare say there are tuning shops all over the United States where they are way past the 181 horses. When it comes to club racing once more it is simplicity itself. The suspension is already well sorted, the roll bar is easy to fix and the adrenalin comes free. My good friend Peter-a former Vietnam Navy pilot is 6ft 3. Could not get into the car fast enough, grinning like a five year old. Known him for a long time, has had some fine cars in his time but this was clearly the icing on the cake. The telescopic steering wheel did help of course. (New in 2019 as is the compulsory back-up camera.) Prices go from a basic 26 thousand dollars to 35 and over. For the record the engine is at the front, it has rear wheel drive (hurrah), strictly a two seater with a fuel consumption of 30-35 miles per gallon. 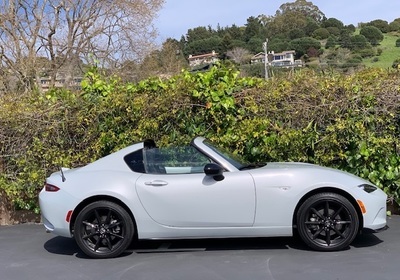 Automotive journalists are a cynical bunch at the best of times but they all go starry eyed at the Miata this writer included. 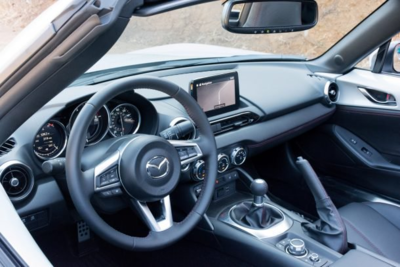 There is none of this “if only I could afford it drivel” associated with tests of Ferraris and McLarens because the truth of the matter is most people could afford a second -hand Miata. I admit that it is definitely not a car for the family but for a young couple who are just thinking about having a baby. After that I am afraid it is Minivan or SUV time. So enjoy it while you can. I loved it!